On December 10, Malala Yousefzai receivied the Nobel Prize for her dedication to achieving rights and access to education for all girls. Certainly the cause of education for girls is among the most noble and the most significant that exist -- after all, educating girls is educating over half the world. Educating girls means increased opportunities for women and reduced incidence of exploitation and subjugation for her, her children, and theirs. A girl with the means to achieve something for herself is more inclined to exercise her right to choose what she wants to achieve, where, and with whom by her side. She is not locked into the whims of those more powerful than herself, because her knowledge and her abilities are her power, and they can free her. As deserving as girls' education is by the Nobel committee, it could not have been championed by a more luminous figure. Malala, the angelic and spirited girl with wise eyes, whose tongue speaks truth, whose dedication is tireless, and whose personal investment almost cost her her very life. Coming from my home country of Pakistan, she has a vision of a brighter future for her kinswomen, and for all women. Just at the dawn of womanhood herself, it boggles the mind to think of what heights she will reach if she has already received a Nobel Prize at the tender age of 17. 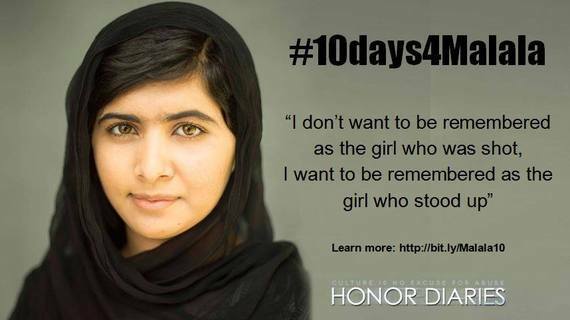 There should be nary a person with a heart for women's rights who does not celebrate with Malala. Yet there is a bit of sadness as she receives one of the world's highest distinctions for her work. The sad reality is that the state of girls' education globally is sorely lacking. Only 30 percent of girls worldwide are enrolled in high school. In sub-Saharan Africa, girls from low-income homes receive less than 2 years education - not enough to become literate or learn basic math. Of the 117 million children not in primary education today, the majority are girls. And the high rate of forced child marriage in some countries means that girls are taken out of school to become wives and mothers before they can receive a meaningful education. Once in that marriage, they are stuck - they have no means of supporting themselves outside their husbands' homes. Why is this still such a problem? While there are regions of the world in which poverty may prevent people from going to school, why is the deficiency felt so much more powerfully in one gender -- why would it not be equal? This is because there still exists a powerful culture of misogyny which believes that girls are less valuable than boys, which is wary of empowering women in the household or in society, and which actively seeks to subjugate and stifle women and girls in order to maintain a familiar and traditional hierarchy. There are some who believe that promoting rights for women is a fundamental threat to their culture, even anti-religious. Malala and I, both Muslims, see the intrinsic worth of women as perfectly harmonious with the tenets of Islam, for example, but in our native Pakistan, a huge backlash against Malala has her painted by some as a Western stooge and an enemy of Islam. Unfortunately, this is a reality which Malala and the international organizations she works with have not impacted, even with their tremendous notoriety, media buzziness, funding, and political pull. The culture of abuse against women and girls' will not be fought by sending textbooks, increasing funding to schools, or educating better teachers. It will not be changed by noble speeches or infographics. In this culture, at the local level, any increase of resources will be used to benefit men and boys, because they are important, and will come at the expense of women and girls, because they are not. The cause of girls' education deserves the recognition of the international community. But before we hope to make any meaningful change in this field, we must work actively to reform cultures which subjugate women, and make it so that women and girls' are given equal access to education and every other type of valuable resource, because they themselves will be valued as more than getters of dowries, outlets for lusts, or birthers of children. Girls fundamental rights to life and liberty must be ensured before we can hope to help them set foot into schools. And we are a long way from achieving that goal. To learn more about women's rights in Muslim-majority societies, watch "Honor Diaries".